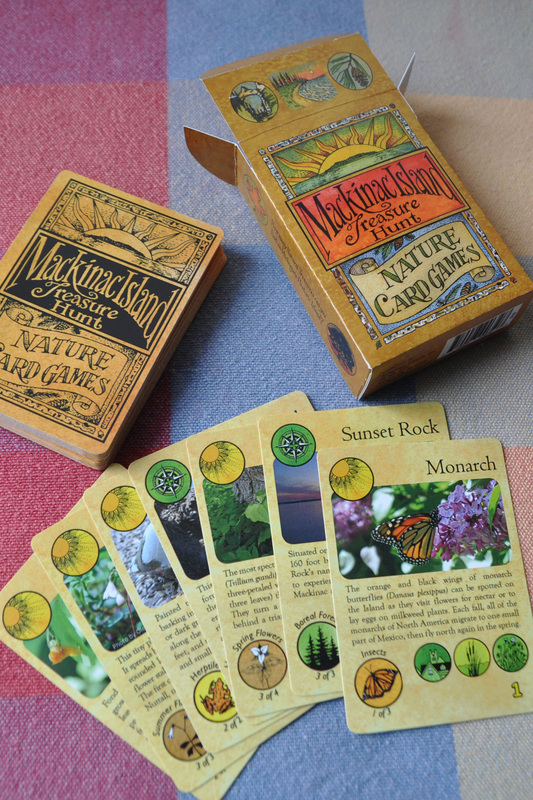 Mackinac Island Treasure Hunt: Nature Card Games is two fun games to play with friends and family that give you a table-top visit to Michigan's fascinating and historic State Park (and the United States' second national park)! Match Me If You Can is a game similar to Author's Cards: There are 54 cards with 16 different categories. You ask other players, or pick up the discard pile, to collect cards of similar categories. When someone plays their entire hand in completed category groups, the game is over, but the winner is the player that played the most cards in completed categories! Memory and strategy are needed to win this game. Watch the video! Follow Me If You Can is a quick game of strategy and some luck. Players score by observing Natural Treasures and Locations that match a Habitat played by themselves or another player. By playing a new Location, a player can score big. Exchange cards with other players to refresh your hand. You have lots of options to mix things up! The game ends when a player plays all of the cards in their hand, but watch out: Rarer Natural Treasures score more points, so make sure to end the game when you are quite sure you will win! Each card in the game features a photo and description representing a Natural Treasure or Location on Mackinac Island. The variety of cards help players learn a bit more about the diverse natural history and long human history of this amazing place! Note: This game is a subset of Mackinac Island Card and Board Games (MITH). It includes some of the cards, the card game and one brand new game not included in MITH.